Pets and furniture don't always mix, and pet owners have many reasons they may not want their furry family members to make themselves comfortable on a recliner, sofa or chair. 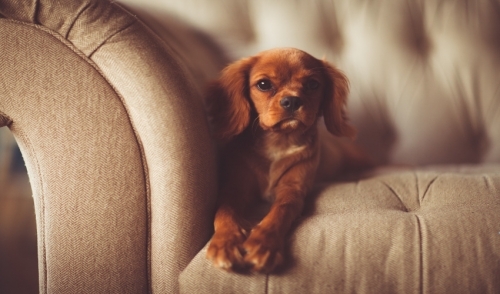 Not only can pets cause stains and odors on furniture, but claws cause snags and tears, shed fur clings to upholstery and pets can even be in danger of falls and injuries if they aren't able to jump on and off furniture safely. But how can you keep your pets off the furniture? It isn't an impossible task, but it is one that will take dedicated effort and careful training. It is easiest to keep pets off the furniture if they never learn that they can get comfortable on it in the first place. Starting training right away with kittens and puppies will teach them to stay off furniture when they are most impressionable. In the case of adopted older pets, training should start from the very minute they arrive at their new home. When training a pet to stay off the furniture, a simple, firm "OFF" command is best. Use the command every time you must block your pet from getting on the furniture, and whenever you have to remove them. When they obey the command, reward their good behavior with a friendly pat or tasty treat to reinforce that they've done well. Give your pet their own comfortable furniture to use and they may feel less inclined to usurp human furniture. A soft, cozy bed or oversized pillow, pet-friendly blankets, a luxurious kitty condo – all of these pieces can give your pet a comfortable place to lounge where they know they are welcome. Train them to return to this dedicated space and reward them when they follow commands. Your pet may be trying to get on the furniture because it wants to be close to you. Do not invite pets to jump up on your lap as you sit on furniture, or they may think they're welcome every time. Instead, get off the furniture and pay attention to your pet while on the floor at their level. Pets may sneak onto furniture when you're not around, but you can make it less comfortable for them. Plastic covers, double-sided tape on upholstery, sharp or bitter smelling sprays, even simply upending cushions so they can't be used are all easy tricks that can make your pets less likely to lounge on the furniture. Startling or scaring your pet can be effective to keep them off furniture, and there are simple alarms you can buy to deter your pet. A homemade version is stacking tin cans on the furniture that your pet will knock off when they jump up – the unexpected noisy crash will scare them away, at least temporarily. Just be sure such a scare won't traumatize them too much, which could create other behavioral difficulties. To ensure pets don't sneak on to forbidden furniture, train them to be content in a crate at night or when you must be away from home and the furniture will be untended. Include comfortable bedding in the crate, as well as fresh, clean water and a treat or toy to keep your pet occupied, and they won't miss the furniture so much. Consistency is key when training your pets not to get on the furniture – every family member should exhibit the same firmness and discourage pets from furniture. Using several techniques simultaneously can help reinforce the message to your pets even more, and eventually they will learn it is better and more comfortable to stay off the furniture entirely.